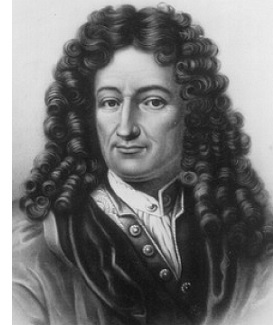 Gottfried Leibniz (1646-1716) - German mathematician who independently developed calculus at roughly the same time as Isaac Newton. While not as famous as Newton, Leibniz's notation of the new math won out and is the one used in calculus today. Without calculus, space flight would be impossible which shows how forward thinking both Newton and Leibniz were. He is also credited with developing the binary system which is the language of modern computers. Although his father, Friedrich, died when Gottfried was only six, he still managed to indirectly influence his son's future. Friedrich was a Professor of Moral Philosophy at the University of Leipzig and, upon his death, Gottfried inherited his extensive library. Young Leibniz began studying from it at the age of seven and quickly excelled academically. Because much of his father's library consisted of volumes written in Latin, Gottfried was fluent in the language by the age of 12. As an adult, Leibniz became embroiled in a controversy with Newton over who was the first to formulate calculus. In 1670, Leibniz invented one of his calculating machines (he was, in fact, one of the most prolific inventors of early calculators). Three years later, he traveled to England and visited the Royal Society (of which Newton was a member). There he gave a demonstration of his calculating machine to those in attendance. They were so impressed that they voted to make Leibniz a foreign member of the Royal Society. A year later (1674), he began his work on calculus, and published his math in 1684. When Isaac Newton learned of this, he accused Leibniz of stealing his work (apparently while he was in England). Newton claimed he began his work on calculus as early as 1666, but did not make any reference to it publicly until his Principia was published in 1687, three years after Leibniz published. The debate raged even after both men died, and it was finally decided that they each conceived their ideas independent of one another.